Klax Vaults is a multimedia installation – a simple hardrive attempting to run a number of operations simultaneously, ultimately confusing itself (misplacing variables, misdirecting outputs) and creating a counterintuitive series of feedback loops & recursion. Through 8 channels of audio and 3 of video, Klax Vaults immerses its audience in a mutable environment of digital windows looking on digital windows, providing a view into the speculative inner-workings of proprietary software. Meet The Artists on Friday July 28 at 7 pm. Open to the public on Sat. July 29th and Sound July 30 from 4 – 7 pm. 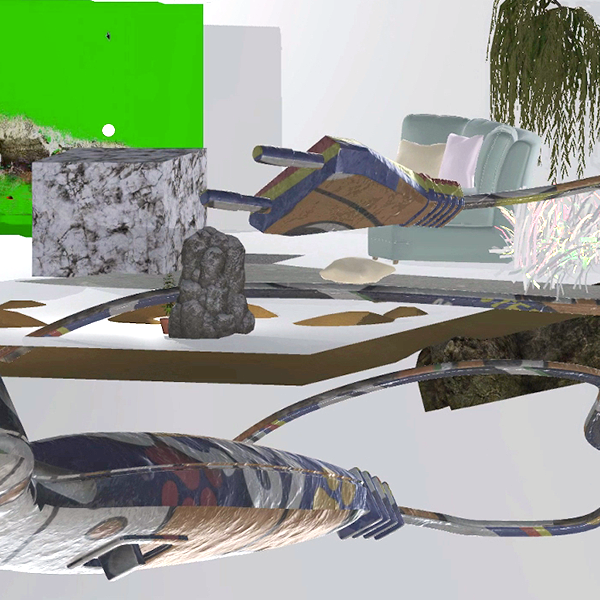 Klax Vaults was initially conceived as a series of individual simulated planes – totemic walled gardens – each depicting an ecosystem informed by the imagined inner workings of a respective proprietary hardware or software. These black-box systems display sparse and minimally active landscapes, operating in ignorance of each other and the outside world, attempting to articulate some vague caricature of a photo sharing network, an online platform for selling goods, or other like digital realms. In its current installation at Harvestworks, these autonomous environments merge into one complex, singular system – an invented digital ecology(?) – effectively ‘breaking through the gardens’ walls’ and forcing each to interact & learn to exist synchronously. Imagine a simple hardrive attempting to run a series of programs or commands simultaneously, ultimately confusing itself (misplacing variables, misdirecting outputs) and creating a more taxing and counterintuitive system of feedback loops and recursion. 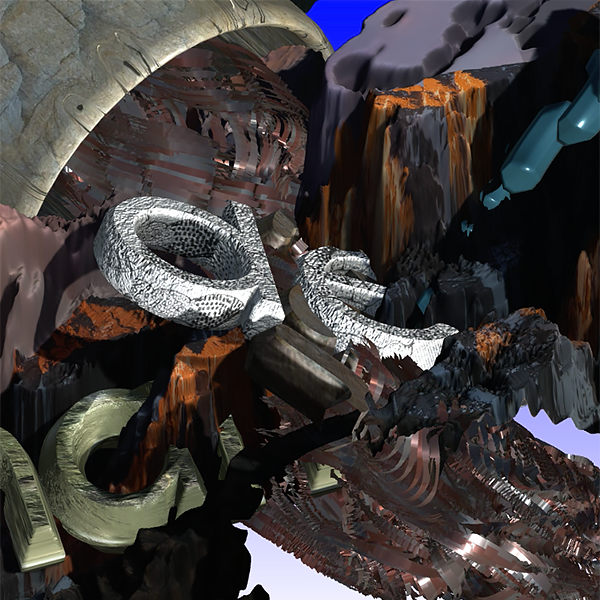 Through a system of software rendering 8 channels of audio and 3 of video, Klax Vaults immerses its audience in a mutable environment of digital windows looking on digital windows, providing a view into Brumley and Werner’s speculative algorithmic topography. It will run as both an autonomous generative system for the duration of its installation & as a manipulatable interface for live performance during the opening reception. John Brumley’s work absorbs contemporary skill sets and emerging forms of diversion into saturated masses of media with the aim of being simultaneously frantic and boring. Emerging conceptions of virtuosity, new modes of learning, and the eminence of “weird trick” solutions have prompted further investigation into the memetics of the mediated physical world. Plotting points at which the motivations for contemporary activities become irrevocably trapped in networks of subterranean fibre. Currently living in Japan and pursuing a PhD. in Empowerment Informatics, Brumley’s research focuses on using mixed reality systems to promote collaboration in physical space. Brumley received an MFA in Design Media Arts from UCLA and a BA in music composition from UC Davis. He has been a Radio DJ, a touring improviser, and a practitioner of Western Javanese Gamelan music. Roy Werner is a Brooklyn based composer focusing on sample oriented composition through custom software written in Max/MSP. Often under the moniker G.S. Sultan, his work intends to dissect sources’ embedded structures & information, processing audio through a network of generative and/or manipulative algorithms in order to shave off layers of ubiquity. The resulting pieces have been described as ‘chaotic, tongue-in-cheek deconstructions of pop banality’ and ‘fragile mosaics of digital pointillism’. Classically trained on piano and a graduate of Mathematics/New-Media Studies at UC Davis, Werner is most interested in the intersection of musicianship and aleatoricism; exploring grey-areas in which performer & algorithm both express a capacity for compositional decision-making. To this end, he has traveled throughout the US and Europe for live performance and has worked with multiple imprints to release recorded work, hoping to catalog some infrequent instances of musician and computer tactically in-sync.